Morgan County Ohio was formed in 1817 from portions of Guernsey, Muskingum and Washington. The county was named in honor of General Daniel Morgan, an officer of the Revolution. 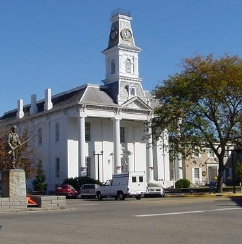 McConnelsville was established as the county seat in 1819. The following townships were in existence as part of Morgan County at that time: Bloom, Bristol, Brookfield, Centre, Deerfield, Meigsville, Morgan, Noble, Olive, Olive Green, Penn, Windsor and York. Deerfield and Noble were organized prior to the erection of Morgan County. The rest of the above named townships were organized under the jurisdiction of Morgan County. Union Township was organized in 1821; Manchester in 1822, and Malta in 1839. In 1845, the townships of Homer and Marion, of Athens County, and seven sections of Roxbury Township, Washington County, were added to Morgan County. In March of 1851, the Townships of Brookfield, Noble, Olive, Jackson (formerly Olive Green), and one-half of Manchester were attached to the new county of Noble.